As an independent, stubborn, and strong-headed breed, the Tibetan Spaniel also tends to be very sensitive and obedient towards its owners. It generally is a pleasant dog with an almost always positive attitude and loves being accompanied by its family and playing games out doors with them. If you’re looking for a cuddlier then look no further, as it will snuggle up next to its owner all through the night! Compared to other breeds, it is very enjoyable and a great house dog. It has plenty of energy to go around and is a great family dog. It has a friendly personality and tends to react well when approached by other dogs. However, it can be timid and reserved if approached by a stranger. As for the upkeep of the Tibetan Spaniel, it tends to have very minimal requirements. It does need its daily dose of exercise but this can be executed by a short run or a long walk. It is a smaller breed so it does not need to be walked, ran, or exercised as often or as strenuously as larger breeds. It can easily survive in an apartment with no issues stemming from the small living quarters. It would not do well surviving outside on its own. Its coat is probably the most tedious task of owning this breed, although it really is not that tedious at all! It requires brushing about twice a week to avoid getting matted fur or knots that pull its skin, as this can be very painful if left not properly groomed. As for health concerns, there are not major concerns that are seen regularly within the breed. Minor concerns include the risk of running patellar luxation or cataracts but those tends to be the extent of it. PRA and portacaval shunt are occasionally seen as well. It is suggested to test your Tibetan Spaniel regularly by running knee and eye tests to be preventative when it comes to health. If you keep a close eye on your pet throughout its lifetime and ensure that it gets regular checkups, then it can live up to 15 years of age! 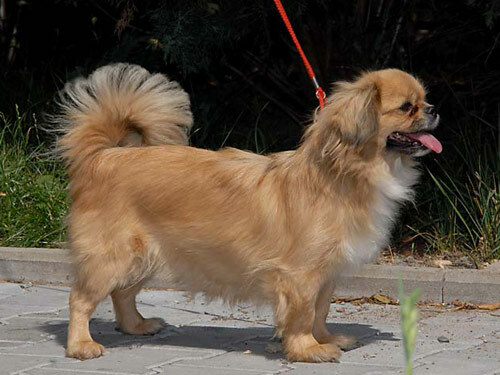 The origin of the Tibetan Spaniel stems from the Buddhist religion and beliefs of Tibet. The lion was regarded as a very treasured symbol and it followed Buddha, like a dog would. Petite "lion-like" dogs that followed their masters were thought of as symbols of this sacred lion and were their existence was a highly praised commodity. Initially, they were often bred with Chinese dogs in the villages; however, the very best breeding took place in monasteries. There, the smallest dog specimens were typically bred; smaller then would be bred in any of the villages. They sat outside of the monasteries, perched and pretty, and would act when strangers or wolves approached uninvited. The very first Tibetan Spaniel came to England in the 1800s. From there, the breed did not make it to American soil until the 1960s. In 1984, it was finally considered a breed by the AKC.